Haven't the credit card companies figured this out and changed their policies yet? Here in the UK it's certainly possible. We call it stoozing. Get a credit card with a long 0% period for purchases and a savings account with as high a rate as possible. Put the money you would normally spend on your regular shopping into the high rate savings account instead. At the end of the 0% period either pay the card off in full or get a suitable card and do a balance transfer. Get a new spending card (may be the same one as the balance transfer card but you often get better deals with seperate cards). I guess people get away with this because the number of people with the skills/diligance to do it right and who can be bothered with the hassle is fairly small. It's still possible, but current money market and other guaranteed rates are so low that it's usually not worth the time and energy. However, even if interest rates were higher and it possibly would be worth it, it's not something that credit card companies worry about. They don't care if you're making money on the side. All they care about is that they make a profit. They make a profit on every purchase you make with that card, and on any future interest you might pay if you don't pay it off in full. For many years, any balance transfers cost between 3 and 5 % one-time fee, in addition to the interest, which is often advertized in large letters to be 0%. It is typically in the fine print, so you might miss it, but there are no offers without it. So no, it is not possible. The fact that it is and has been possible is not because the credit card companies hadn't figured out people were doing it, it was because most people were NOT doing it or made mistakes and ended up losing money as they did it. I had a professor in college who did this as a hobby. He borrowed cash back from credit cards with 0% interest on cash advances and invested it, then shifted the debt around from credit card to credit card that allowed him to do this without charging. He spent a lot of time researching these cards and was constantly signing up for new ones. Ultimately he said he probably made about minimum waged on this. 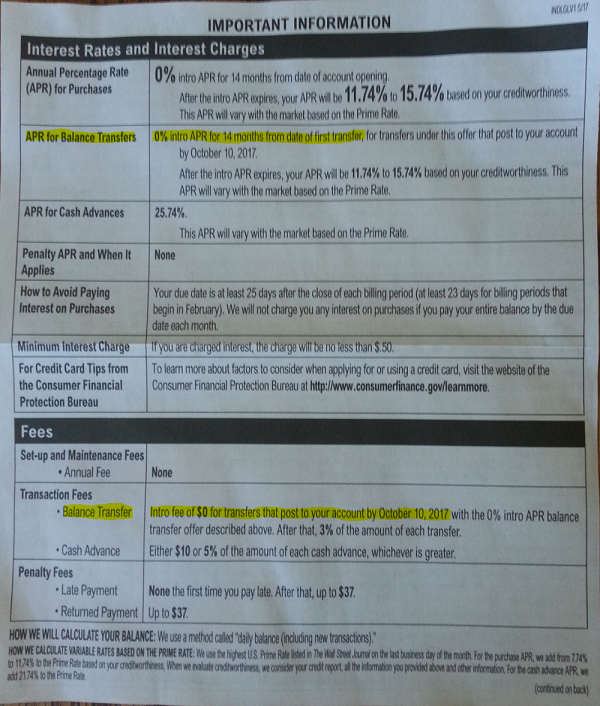 You do have to check the fine print carefully because there are frequently non-obvious fees that wipe out your profit. Though credit cards with no fees for cash advances are not common, I would think the limiting factor for this to be an arbitrage would be the opportunity for a risk-free investment that earns enough money for it to be worth it. At current interest rates, risk-free investing is not a very attractive proposition. Not the answer you're looking for? Browse other questions tagged credit-card arbitrage loophole or ask your own question. If I just moved, am I more likely to be rejected for a credit card application? What happens if pending charges total more than my “total available credit”?